THINGS TO DO IN TIRANA, ALBANIA! Tirana is a city that grew on me and which I wish I had more time to explore. In this article, I will tell you all about the best things to do in Tirana from my recent visit. From street art and museums, to food, culture, landmarks and historical monuments, Tirana is a fascinating and really interesting city which exceeded my expectations. I found the people extremely friendly, surprises at every corner and just a generally bright outlook for what was a grey city for the many years of the communist regime. Tirana is like a raw version of Berlin, with far less monuments and landmarks than Europe’s hipster capital, far less vegan/organic/Instagram perfect cafes (if any) and yoga studios but with the same spirit of “anything is possible”. At least, this is how it felt to me. If you are wondering what to do in Tirana, then this is the right place to be. While Tirana may not have the many tourist attractions of other cities like Paris or London, or the heritage of Kotor in Montenegro, it is a pretty exciting place to see the recent revival the country has been through. Not long ago, before 1991, the country was the poorest in Europe and had just come out of a grim 45 year period of communism. There was barely any infrastructure and the total isolation at the gates of the 21st century meant it had a lot to catch up on. Today, The streets of Tirana are lined with public art, murals, wall paintings and colorful art. Public furniture has been turned into art pieces and cafes are popping up. The air is that of hope and revival, and the city’s landscapes continuously change to welcome new art installations or new buildings. You can’t help but feel hopeful as you explore the many places to see in Tirana. However, you should not leave without learning more about the brutal regime at the Bunk’Art museum to better understand the country’s psyche and hunger for progress. Some of the best places to see in Tirana are located on a circle around the main landmark, Skanderbeg Square. This makes it easy to set out on a day of sightseeing. I explored most of Tirana on foot, walking for quite a few hours everyday, and found that this is the best way to “live” the city. There are a lot of opportunities for serendipitous moments if you simply wander around and this also gives you the opportunity to see everything in between the main Tirana attractions. Stop by for a coffee or an ice cream whenever you please, or simply sit down on one of the many benches. This is also how I spotted a lot of the street art. It is hard to pinpoint a specific location because art in Tirana is everywhere and usually found in the small functional elements like the electricity or telecoms boxes that line the street. So my recommendation would be to take this list of things to do in Tirana and set out a daily itinerary with the help of my map below. I feel that a lot of people come to the country and head right out to the mountains or the beaches of Albania without spending any time in the capital. That would be a shame and I hope this article will convince you to spend a bit longer. Ideally, you should set aside three days to cover all the top things to do in Tirana mentioned on this list. If you only have two, that is also fine, you may just have to skip some of the landmarks. Most visitors would then simply leave the Bunk’Art 1 and the cable car out as they take the most time and are out of the city. Most visitors to Tirana will visit Bunk’Art 2, but not a lot make their way out to Bunk’Art 1. I found Bunk’Art 1 more interesting, primarily because a lot of the information (and even exhibits) provided in Bunk’art 2 around the Sigurimi (Secret Intelligence) can also be seen at the House of Leaves, so it felt a bit repetitive, but still worth a visit. Bunk’Art is an initiative supported by the Albanian NGO Qendra Ura that aims to preserve these massive underground bunkers built by Enver Hoxha by telling their story and that of Albania’s history through exhibits and art. Hoxha planned to build 210,000 between 1975 and 1985 but the project stopped in 1981 and only 175,000 materialised, one for every 11 Albanians at the time. There were three types of bunker constructions: mountain sites, buildings and pits, all of which were conceived to survive a nuclear and chemical attack. Bunkers were built in varying sizes all across the country, some were big enough for one person, others could fit the entire Ministry of Internal Affairs. These bunkers were meant to protect and defend the country in view of an attack and were located all over, although a lot were placed as the first line of defense along the Albanian coast. The attack never materialised, and the bunkers are a stark reminder of the 45 years of dictatorship and communism, and of the leader’s paranoia. Some have been turned into hotels, bars, shepherd’s huts, animal shelters, you name it. But the two most important ones have been converted into museums. While looking out for bunkers is a fun thing to do while on a road trip around Albania, and you may be able to simply stop by and get in, the largest ones are in the capital, Tirana. These two have been turned into museum/art installation and combine interactive exhibits with explanations, an audio guide, virtual reality sets and art installations that talk about the communism times. Bunk’Art 1 was the first one of the two to open and it is the atomic bunker of the dictator Enver Hoxha. The museum opened to the public in 2014 and relates the history of the Albanian communist army and that of Albanians during the regime. Bunk’Art 2 is located where the Ministry of Internal Affairs was supposed to be in case of an attack and is dedicated to the Sigurimi and the oppression that the people of Albania suffered during the regime. At Bunk’Art 1 you will be able to learn more about the years between 1939 and 1991. The country’s involvement in WWII, how the Communist Party of Enver Hoxha came to power, and the lives of regular people during the time. A lot of emphasis is put on the political side of the regime and the evolution from strong ties with other communist leaders from Yugoslavia, China or the USSR to the complete isolation after the 60s, when Enver Hoxha severed ties with all other countries and plunged into total isolation and full on bunkerisation. Bunk’Art 1 is focused on the years pre-communism and the time Albania spent under Italian fascist rule, Greek occupation, German occupation and finally, under communism. Through the exhibits you will also be able to learn more about how the regime evolved and how it became more and more isolated and paranoid about the fear of an attack. There are two types of rooms in the museum: rooms that are just how they were when the bunker was inaugurated in 1978 and exhibit rooms. Exhibit rooms are filled with explanations, videos of events, lots of photographs, newspaper clips, movies of the time, communist paraphernalia and rhetoric, etc. The documentation is laid out chronologically starting in 1939. There are dozens of rooms that have been preserved intact. Most notably, you can enter into the room built for Enver Hoxha and that for his Prime Minister, Mehmet Shehu. They are both intact and have been preserved as they were left. It is fascinating to see how the objects were placed and what sort of luxuries he afforded himself even five floors underground. It is also amazing to see the technology used to keep the bunker not only safe in case of an atomic attack, but also well stocked with oxygen and water. There is also a room for The Socialist Home which displays what the standard living room of the time looked like, complete with furniture and electronics. Bunk’Art 1 is also where you will be able to learn more about the bunkerisation program which led to the construction of this building and 175,000 more. This is perhaps the most bizarre thing to see in Albania. Although the final number of bunkers built is undetermined because the documents were top secret and destroyed, the museum states there are 175,000 and you can see various photos of the different models and a map. 1. Bunk’art 1 is located near the cable car so combining both of them makes for a convenient day trip. You will need a taxi to get there or if you have a car, you can drive. The last bit is through a one way tunnel, truly hidden. 2. You should plan to spend anything from 2 to 3 hours minimum there as the museum is very very large and spread across 5 underground floors. 3. Expect to walk a lot. It takes 5 minutes just to walk from the booth to the entrance and then the bunker is so large that I think I walked over 7,000 steps. 4. It is extremely cold inside the bunker so bring a sweater in the summer months. 5. You can download an app that works as an audio guide. It basically reads out what is written in signs before every room and has some additional insights. You will need your own headsets for that. You can also just buy one and share the headset if you are visiting with someone else. 6. There are cameras in almost every room and signs that ban photography. 7. There is free WiFi inside the bunker so that you can stream the audio guide, but it was constantly off and I could not even hear the audio guide so don’t count on it. Bunk’Art 2 is similar to Bunk’Art 1 but smaller and focused on a different part of the regime: the intelligence service, Sigurimi, and the leader’s obsession with control and surveillance of the population. Bunk’Art 2 opened in 2016 inside the bunker that was supposed to house the Ministry of Internal Affairs in case of an attack and is dedicated to the victims of communism’s terror. It is considered the last important work by the Construction Enterprise 10, the organisation that was in charge of the program of bunkerisation, and is a pit type of bunker, built in a pit that was dug out next to the Ministry of Internal Affairs and topped by a roof over 2m thick. The bunker was only finished in 1986, five years after the bunkerisation project ended and after the death of both Enver Hoxha and the Prime Minister. There are 24 rooms in Bunk’Art 2. The chronological exhibits start earlier, in 1912, when Albania achieved independence from Turkey and the King rose to power, and continues until 1991 with the fall of the regime. Most of the information provided delves into the intelligence service, the regime’s weapon of control, and the leader’s obsession with creating a vigilante country where thousands of people were being kept under surveillance through a pyramid structure with thousands of recruited civilians spending their days reporting on their compatriots. Aside from the exhibit rooms, there are also a few art installations that illustrate elements of life or of the bunker itself. For example, the entrance and exit gates and decontamination rooms have been turned into an interactive art installation. The degree of abuse of the population exercised by the government of Enver Hoxha is clearly showcased through the many rooms which talk about the Sigurimi and its measures, the technology used and the extreme prosecution of anyone considered an enemy. You will also learn about the most disturbing sides of the regime. For example, there were express orders to kill anyone that was found trying to cross the borders, in or out, and the Border Police had dogs trained to a attack and kill anyone. There are rooms dedicated to the surveillance equipment the regime developed to spy on people as well as the surveillance on the very few foreign diplomats and businessmen allowed in the country during the time. It all feels very grim, if a bit James Bond. Perhaps the most difficult rooms are those dedicated to the prisons and forced labor camps of which there were more than 100, and the videos of the account of life in those by local Albanians who survived. It is believed that the regime imprisoned more than 30,000 people most of whom died due to inhumane living conditions, hard work or starvation. If you visit Kruja Castle and Skanderbeg Museum you will be able to see one of the prisons which has been preserved as a museum. Bunk’Art 2 is located right in the center of Tirana, by the main square and Skanderbeg’s statue, so it is far more popular to visit because it is easily accessible to tourists. The bunker’s entrance is right at ground level and was built recently as the original bunker was only accessible from the Internal Affair Ministry. As you walk down, check out the thickness of the bunker’s roof. Most of the exhibits are at the same underground level. 1. Bunk’Art 2 is not as cold as Bunk’Art 1. 2. The audio guide for Bunk’Art 2 does not work. Despite the museum being ready for it and there are signs that indicate it does, it is not yet activated, but the VR part of it works so it is still worth to download the app just to see it. Not essential though, as it is more of a fun gimmick than anything else for now. 3. While Bunk’Art 2 is smaller than Bunk’Art 1, you should still budget a minimum of one hour to wander through the many rooms and exhibits. 4. If you are planning to visit the House of Leaves, you may see some duplication in the content as it is also focused on Sigurimi and some of the materials on display are the same. 5. Some of the exhibits, especially those that talk about the regime’s torture and abuse of political prisoners, can be a bit disturbing. For example, I preferred to skip the room where the many torture techniques used by the regime were listed. There are two hotels with top floor bars that have views over the city. One of them is the Sky Tower’s rotating bar and restaurant, and the other is The Plaza Hotel, which has lovely views over Skanderbeg Square. Tirana comes alive at night when the twinkling lights come on so make sure to arrive before sunset and see it come down on the city. The Dajti Ekspres cable car is quite far from the city center but near Bunk’Art 1 so it makes sense to combine the two, maybe even with the Museum of Armed Forces. While Tirana is almost flat, and makes for an easy walk, the cable car takes you up the Dajti Mountain over a 20min ride and it can get pretty scary. I will admit that as we were approaching the top, I started to get a bit queasy, although I do not have a fear of heights, but hanging there at such altitudes with the void underneath was quite impressive. And the ride felt longer too! The best time to take the cable car is at sunset so you get up there when the sun is just about to set and enjoy a lovely drink or dinner with the best views at either of the two restaurant, one of them is a rotating one in the Dajti Tower. But if you want to enjoy the mountain a bit more, there are a few activities at the top so you don’t have to go there just for the ride and a drink. There is a mini golf, hiking routes and even options for paragliding. For the best views, check the viewing platform on the 7th floor or go to the restaurant on the edge of the mountain. If you want, you can also spend the night at the top, at the Belvedere Hotel, which has incredible views over Tirana, and come back down the next day. Guests get free cable car tickets. 1. Bear in mind that the mountain is 1,000m above sea level, so it can get really cold. When I visited, first week of September, the temperatures were likely 10 degrees lower at the top and I did not have a jacket, so we had to rush back down because I was freezing. 2. Make sure to buy a return ticket, the walk down would take 4-5h easily. 3. Check the return times for the cable car. In the winter, the last cable car down is at 7pm so dinner is not possible. 4. The cable car does not operate on Tuesdays. You can find more information on the cable car’s website. If you love architecture and street art and are looking for what to do in Tirana, look no further. The former Mayor of Tirana from 1991, an artist himself, faced with a small budget and a very grey and dilapidated city, embarked on a project to repaint the facades of many buildings with the aim of revitalising and bringing some color. The project was partially funded by the European Union and painted a lot of the streets with bright colors. Some of the most beautiful ones have rainbows or trees on the facade, and there are even some with wall murals with children. Finding them can be quite tricky though, as they are not marked on any map, so I have attempted to document them in my map above. There are a lot of painted buildings and wall murals across Tirana, but some of them are more famous than others. You can find out more about his project and his vision for the city in his TED Talk. Wilson Square, named after the American President, is home to perhaps the most famous of the colorful houses of Tirana because it is easily recognisable for its rainbows. The square has painted houses on all four corners but two of them are the most colorful. You can walk back from Wilson Square to Skanderbeg Square along Kruga Abdyl Frashari and spot all the colorful buildings on the street. The entire street was painted, mostly in orange, yellow and green colors, but you may also spot some other ones. Vasil Shanto is the name of a school and I am using it to refer to some more colorfully painted buildings, this time with stripes. They are pretty nice even though the lines are not 100% straight. Zogu I Zi Square is a large roundabout with lots of traffic and one of the main exit roads from the city. It is also a great place to look out for colorful buildings and wall murals as there are a few. If you go off a bit from the main square you will also find some wall murals and maybe you can spot the facade with growing trees. Blloku is the hip area of Tirana. This is where the beautiful people come to play and have fun and, unsurprisingly, it is also a great place to come hunt for street art. There are many galleries around and also lots of spontaneous art expressions in the street. Art installations and wall murals all play their part in making this area of the city the trendiest ever. I marked the Vintage store and the blue portrait mural on the map so you can start there and wander around looking up for more great street art samples. If you are looking for a fun, happening and open part of the city to come chill and people watch, this is it. Blloku is the area of Tirana where the wealthy used to live and is now filled with cafes, bars and galleries. There is street art, there are groups of friends having a laugh and loud music at night. No matter what time of the day or night you drop by, Blloku is where the beautiful people come to see and be seen so grab a chair at one of the outdoor terraces and do as locals do. I highly recommend coming here on a weekend morning and picking one of the cafes to simply people-watch. This is where the modern Albania is being brewed, together with a strong and thick cup of Turkish coffee. You are driving along one of the busiest roads in Tirana and suddenly, an 18th century bridgepops up. This is Tanner’s Bridge. It was at the entrance of Tirana closest to the farming areas and was once used by farmers to ferry their goods into the city, hence the name, and is still very well preserved and in use as a bridge for pedestrian traffic. The Plaza Hotel in Tirana was built around the tomb of Kapllan Pasha and they gave it a golden semi-dome to surround it in a dramatic manner. What makes this monument extra special is its past. The tomb was part of the old mosque of Tirana which was destroyed during WWII and formed part of the original Ottoman religious ensemble and center of Tirana which included the Et’hem Bej Mosque and the Clock Tower. Skanderbeg is Albania’s local hero and is remembered and honored accordingly across the country, most notably, in the capital, with a statue in the main Skanderbeg Square. The square is the most happening and lively spot in the city and there are always lots of people, art installations, tourists and locals. 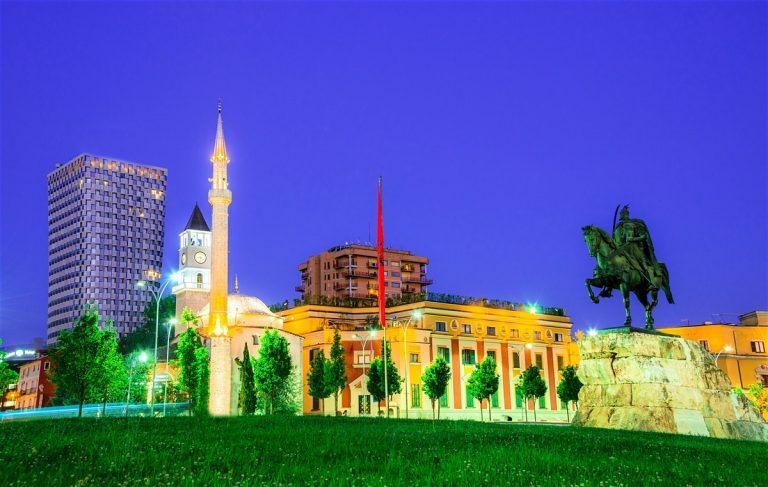 It is flanked on one side by the National History Museum, on the other by the Palace of Culture, the Et’hem Bey Mosque and the Clock Tower, and the last one by the many Albanian ministries and a park. When I visited there was an art installation with colorful plastic sofas where people were reading the newspaper. There is also a merry go round which will be the delight of kids and adults. Skanderbeg Square is where you should start your exploration of the best things to do in Tirana. It is a major landmark and easily located. The entire area is pedestrian and closed of to traffic. The Palace of Culture was a gift from the Soviet people in 1960 but was only completed after Albania severed ties with the USSR in 1961 because Enver Hoxha considered them too lenient in their communism ideology. The palace is an imposing white building with large columns made of shops, art galleries, a library, and the National Theatre of Opera and Ballet of Albania. The National History Museum holds the country’s history from the very beginning, thousands of years ago, until today and is a good place to start to learn more about Albania. The exhibits start in the Antiquity, with Albania’s and the region’s historical inhabitants and gives background to the Illyrians, the tribes that occupied most of the territory before the Romans and Greeks invaded. While the museum is filled with artefacts, exhibits, maps, pieces of monuments, paintings, documents and several other items, and is big enough to fill a few hours, I found it particularly interesting to get a good view of Albania’s multicultural past. Albania went from being Illyrian to Greek, Roman and then through the control of several other tribes until Ottoman occupation that extended until the 20th century, national resurrection, Fascism, Communism and finally independence. The signage of the museum is in English and there is a nice shop where you can buy souvenirs or books about Albania. And make sure to admire its colorful facade, a mosaic titled Albania that shows the country winning and proud from Illyrian times to WWII and is a communist-looking artwork reminiscent of the many similar grand monuments in places like North Korea. You can find more information on the museum’s website. The Clock Tower was built in 1822 by Haxhi Et’hem Bey with the financial help of the wealthiest families in Tirana and is one of Tirana’s main attractions. Originally, the clock tower did not use to show the time, only mark it when the bell was rung, and was 30m high. But this changed in 1928 when the tower was made 5m higher, a balcony was built, and four clocks from Germany were added. This modernisation symbolised Albania’s, with the lower part of the tower in the older Ottomani style and the upper parts in Western Venetian style. The Clock Tower was the tallest building in the city until the 1970s and, together with the Et’hem Bey Mosque, is one of the most recognizable landmarks of the city, although other interesting buildings are coming up. When you visit the Clock Tower, look at the back where there is a colorful wall mural with geometric shapes. One of the many examples of Tirana’s street art. Et’hem Bey Mosque was built in the 18th century and is located right by the Clock Tower at the edge of Skanderbeg Square. It is one of the most relevant landmarks in the city. The mosque was built over 20 years at the end of the 18th century by Molla Bey, Haxhi Ethem Bey and Suleijman Pasha and was one of the buildings that made up the old center of Tirana which included the Bazaar and two mosques. The mosque, like all other places of worship, was closed during the communist regime of Enver Hoxha but survived the purging of the regime during the “Cultural Revolution” because it was a national monument. The mosque reopened in 1991 when 10,000 people came in carrying flags. The facade of the mosque is undergoing restoration in 2018, so it was covered in scaffolding and closed. This gold-painted cathedral was only opened in 2012, 11 years after religion was allowed back again into Albania, and its dome is decorated with impressive murals. Outside, there is a tall bell tower and a chapel. The building is one of the most outstanding in Tirana because of is beauty and it is said to be the third largest Orthodox cathedral in Europe. You can find more information on the Albanian Orthodox Church website. The House of Leaves is a museum dedicated to the Sigurimi, the Albanian secret service during the Communist regime. The museum is located on the site of what used to be Dr. Basho’s Women’s Clinic until it was turned into the headquarters of the Central operations of the technical-scientific unit of the Directorate of the State Security, the Sigurimi, in the 1940s. This particular unit was tasked with the interception of telephone and postal communication and with the surveillance of foreigners. It operated under secrecy from the 40s until 1991 when Sigurimi was dissolved. The House of Leaves is a great place to learn more about the regime’s infamous and notorious obsession with surveillance. You will be able to learn more about the techniques and tools used and also how the general population felt. Enver Hoxha’s regime was so obsessed with this and with the threat of an imminent attack that it went to extensive lengths to have everyone under surveillance. You will be able to watch movies interviewing some of the members of Sigurimi and foreign correspondents and diplomats stationed in Albania during the regime. There are also some of the regime’s propaganda movies and posters on display as well as many examples of the ducting and censure of the time. What I found most interesting were the many quantitative tables and graphs that showcased the extent of the surveillance. Most remarkable was the survey carried out after the regime’s collapse which showed that 75% of the population felt the regime’s spying was “Too much”. If you visit Bunk’Art 2 you may find some overlaps between the two, with the same exhibits and equipment displayed in both places. Shëtitorja Murat Toptani is one of the most pleasant shopping streets in Tirana. It is largely pedestrian and tucked behind The Plaza Tirana Hotel, in the center of the city. While a stroll along the street is one of the most peaceful things to do in Tirana and worth it on its own, you should also try to look out for some of the old remains of Tirana Castle, wall and the few landmarks that once stood there. There are signs along the street that give more background about each of them. Practically across the street from Postbllok Checkpoint you can find Tirana’s Piramid, one of the most bizarre things to see in Tirana and a very recognisable symbol of the city. The Pyramid of Tirana is a dilapidated and abandoned large pyramid-shaped building at the top of a large concrete steps and surrounded by some trees and more concrete. The building was originally built as Enver Hoxha Museum in the late 80s by his daughter and son in law who wanted to honor the dictator’s death. With the fall of communism, the pyramid went into disuse an remained one of the symbols of a country that was the poorest in Europe at the time but wasted enormous amounts of money on the personality cult of its leader. After the fall of the regime, the building has subsequently been given many lives; as a nightclub, as the base of NATO during the war in Kosovo and as a convention center. Today it stands broken, with several of the windows cracked, falling signs and crumbling concrete walls. Even its shiny marble walls are now mere raw concrete, the perfect canvas for graffiti artists. Although there is currently nothing inside the pyramid and you cannot go in, you can still climb it, and many local kids and teenagers do so. You will need shoes that let you go up a 45 degree incline concrete surface. 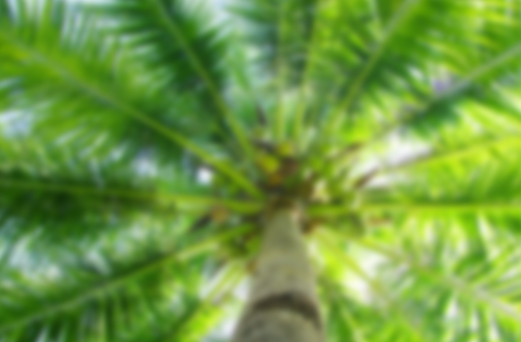 At the top, there is a flat surface where you can sit and enjoy the views, if you make it. Be careful when going down as you could easily tear your trousers in the rough concrete. Projects to revitalise and remodel the pyramid have been in the making for years. In 2011 the government announced plans to demolish it, but it never happened. Who knows, maybe the pyramid will one day morph into something else, disappear or bring new life to the city. Tirana is one of the most exciting cities to walk around. Not because it is filled with heritage or beautiful monuments, but because lots of serendipitous art installations dot the city. So one of the best things to do in Tirana is to go on an art installation treasure hunt. Here are some of the best ones. Almost every bridge along Bajram Curri Boulevard that crosses the Lana River has some sort of art installation. Sometimes a bicycle, sometimes mushrooms, sometimes a person. Look out for them, what can you find? The famous upside down umbrellas of Ágitagueda art festival in Portugal can also be found in Tirana, near the exit from Bunk’Art 2. Although they are not fully well maintained and some of them are missing or damaged, you can get some shade under the red and blue art installation. I don’t need to actually mark this on a map because the electric boxes are everywhere. You will find them located at every corner. Most of them are painted with cartoons from Hollywood, others with other fun characters like Angry Birds. But they are very colorful and bring a bit of color into what was a grey city. It is the same idea behind the colorful painted houses. If you are paying attention, you may notice that Tirana’s walls are painted with sunflowers. These are slightly reminiscent of San Francisco’s hearts in that they follow a similar philosophy and have the same purpose. Your are a sunflower is an NGO that was established in 2017 with the aim to help children in need. It all started with t-shirts with the printed sunflower designs and then has evolved into wall paintings with the same sunflower. Each sunflower is awarded in exchange for a donation amount which goes all to fund Elbasani Hospital. How many can you find? The Cloud of Sou Fujimoto is a famous 3D semi-transparent white pavilion in a grassy area in front of the National Gallery that is not only a monument to see but also an interactive space where you can sit down and read or watch the world go by, or a space for events. The structure is made of steel bars built in rectangular shapes and has a few steps and platforms. This is not a permanent structure, it was before in Kensington Gardens in London, so it will probably be dismantled in 2019. You can get up close with some of the most relevant elements of Hoxha’s regime and the communist times next to each other at Postbllok, a small park you could easily walk past without noticing. Here, you can find three of the symbols of Albania’s 20th century suffering. There is one of the few remaining bunkers in Tirana and the one which guarded the entrance to the residential area where Enver Hoxha lived. A piece of the Berlin Wall from Potsdamer Platz gifted by the City of Berlin to Albania. And the concrete supports of the mine in Spac, the most infamous and horrific of the regime’s forced labor camps which operated from 1968 to 1990. This is considered a memorial and was put together in 2013. Everybody likes to take photos for Instagram and some of the best attractions in Tirana are not particularly photogenic but rather communist-looking landmarks. But this one is. Some other cities have I Love CITY signs, like Baku or Amsterdam, and so does Tirana. You will find it a bit further down from the Postbllok and the Tirana Pyramid. The letters are all in different colors and the heart is in red with a playground-friendly shape that makes children happy. You can also sit at the bench right in front of the sign and simply watch people come and go taking their shots. This is a memorial to the independence of Albanians and was inaugurated in 2014 one hundred years after the country’s independence from the Ottoman Empire. The monument is made of two golden pieces that make an open tower. On one piece there is the Albanian eagle and on the other, fragments of the Declaration of Independence. When brought together the two pieces make a kulla tower, a traditional Albanian square watch tower. The monument was designed by Austrian artists Visar Obrija and Kai Kiklas. One of the most unexpected things to see in Tirana are the ruins of a Roman settlement. They are very off the beaten tourist path and not usually visited by anyone so you are likely going to be there alone. This is Tirana’s earliest ancient archeological site and consists of a Roman settlement from the 1st century AD. The highlight is a basilica with rich and relatively well preserved mosaic floors which help date Tirana’s first settlers and other elements around it. The site was discovered in 1972 when some flats were being built and the tiles were cleaned and preserved to today’s conditions. There have also been subsequent restoration efforts since. You will find the site near a street and covered by a plastic roof. There is the small office of preservation onsite but the entrance is not gated and is free. Ok so you probably have never heard of Albanian food before but, as a foodie and all round food-obsessed individual, I believe that eating local foods at any destination is a great way to learn more about the culture. For example, the food in Azerbaijan really gave me an insight into the country’s melting pot of cultures. Food in Macao does the same, with African, Portuguese and Chinese influences all blending in. Albania was no exception. So when wondering what to do in Albania, add “eating” on the list. But where and what to eat? You will not find any McDonald’s in Tirana, in fact this is one of the interesting facts about Albania, but you will find quite a few great, and hyper-cheap local places to eat and lots of cafes for a generous dose of caffeine. I loved trying the various foods around and tried to look out for new dishes every time we sat down for a meal, so check out my post about Food in Albania for all the details. Meanwhile, I leave you with three items that you will no doubt find on every Albanian menu. Fërgesë is a combination of baked cheese in a spreadable form with roasted peppers and tomatoes and it is absolutely delicious. You can even eat it on its own with some bread for a really filling starter or main. The cheese is usually a mix of cottage cheese and goat cheese so it can be quite salty, hence the need for sweet pepper and tomatoes to temper it. Byrek, also spelled Burek, is a typical dish of both Albania and Montenegro. Variations can also be found in Turkey and in other parts of the Middle East. This is a millefeuille type of pastry filled with something, usually cheese, though you can also find tomatoes and cheese or even meat or spinach. Byrek is eaten at breakfast by the locals or at any time of the day, and in a meal, it is usually a starter or snack. It is rare to sit down for a meal and not find it on the menu. Stuffed aubergine or peppers, usually with cheese or sometimes with meat, are also a great Albanian dishes to try. In Tirana, you can find lots of international restaurants and casual eateries, and very few fine dining spots, but for truly local no-frills Albanian food, everyone will recommend to try Oda. This is as rustic and homey as you will find. The restaurant is decorated with Albanian artefacts including a strange-looking life-size mannequin dressed in traditional clothes, and one of the rooms has Ottoman sitting on low tables and cushions like the ones you find in the traditional houses of Gjirokaster and Berat. Beware, Oda has become quite popular and the waiting times can be long. They have no system for it either so it can be quite chaotic not to know when/if you’ll sit down. So go either early (before 7pm) or late, after 9pm to minimise your wait. Or come around, leave your name and go for a drink elsewhere. Not all the things to do in Tirana are actually in the city, some of the best attractions are actually outside the city. For example, you can visit an organic farm and winery or go check out an ancient Roman amphitheatre, or the castle devoted to the national hero, Skanderbeg. If you have a bit more time in Tirana than just two days, then I would recommend heading out into the countryside and combining both of the sights below: Uka Farm and Castle of Kruja. Uka Farm is an organic farm and winery in the outskirts of Tirana. It was founded by a former Minister of Agriculture and is now being taken care of by his son. Uka is their family name. No matter what day of the week you visit, the farm’s restaurant is always packed with locals enjoying the oversized portions of incredibly juicy BBQ meats. The guy who cooks it, in front of the hot coals, is incredibly skilled and the heart of this food operation. Pair the great meats and starters with some of their red wine. If you have the time, make sure to book a winery tour as well, so that you can wander the organic farm and biodynamic vineyards and taste their wines. The Castle of Kruja or Krujë Castle, is a large castle and fortress located about an hour’s drive from Tirana, on top of a mountain. In the same complex you can also find a mosque built by the Ottoman ruler who finally defeated the castle’s defenses, an ethnographic museum and an old bazaar. Skanderbeg Museum, opened in 1982, is also located on site. The castle’s history is also that of the country’s hero, Skanderbeg. Born Gjergj Kastrioti, he was key in Albania’s resistance to Ottoman rule. Kastrioti was the son of a nobleman and was taken by the Ottoman king as a young boy to complete his education in the Ottoman Court, as was the case with Alexander the Great. Upon his return, he led several uprisings against the Turks, most notably from the castle which resisted three sieges between the years 1450 and 1467. The castle eventually fell in 1478 after his death. The name Skanderbeg was given by the Ottomans and comes from the Turkish Iskender, which refers to Alexander the Great and compares the leader to his bravery and prowess. The museum showcases the life of Albania’s hero and his military achievements and has a replica of his arms on display, the original ones are in the Museum of Vienna. His arms are symbols which you may see across the country. For example, there is a popular and widely spread petrol station chain which bears his family name, Kastrioti, and has his goat-topped helmet as a logo. You can also see artefacts and furniture of the time, books and documents that prove his political alliances and dealings with the world leaders of the time and lots of other references. Outside the castle, an ancient bazaar of the time has been transformed into a souvenir market of sorts but is pretty well preserved. Be sure to bring the right footwear. The typical cobblestoned streets that are common of all other old towns in Albania can be found here, only they are even more slippery and the path up the castle is steep. Driving up the castle, which is located in the town of the same name, requires a series of hairpin turns that are not for the inexperienced driver. You have been warned. There are a lot of hotels in Tirana and several other accommodation options like Airbnb and guest houses. Below you will find the best hotels in Tirana. This is my favorite in Tirana. The newly opened hotel is modern, sleek and hip and the top hotel in the city. It has great views from the top restaurant, a fabulous location right in the middle of the city, and comfortable designer rooms. It also has a few of the best restaurants in Tirana, an amazing spa and a very well equipped gym, plus friendly service. Breakfast is also well worth it. The plaza is located right by Skanderbeg Square so it is perfect if you are coming to explore the city on foot as most of the things to do in Tirana are walking distance. This was the former Sheraton Hotel in Tirana and a primarily business hotel conceived for the visitors that are coming for meetings at the adjacent convention center. The rooms are older than the Plaza and have a bit of that hotel chain feel. There is a lounge for the rooms with lounge access but I would say it is not worth the money. While it has nice views and snacks all day long, there are non alcoholic beverages available. The complex is large with a few dining alternatives. Breakfast is pretty good too, and has a section for local Albanian items. What sets this hotel apart from the rest is the outdoor pool, which seems to be exclusive to the Mak Hotel, and comes with a few sun loungers and a grassy bit. The Mak Hotel is nearest to Blloku so if you are coming for business or meetings, you will be close to the more happening part of the city. This is a boutique hotel with only six rooms in what is probably the most happening spot in the city. Padam Hotel has the only fine dining restaurant in Tirana and one of the poshest and most popular bars. The restaurant is located in Blloku, as expected, and is a happening spot to see and be seen. The rooms are modern classic with cool touches and located inside an older building with more character than the tall towers of the previous two hotels.